You know I love birth stories, but even more, I love birth books. A birth is so much more than just the act of giving birth- it is history, drama, emotion, love, hope and sometimes dissapointment, all rolled into one. To really understand a birth you need to know so much more than just what happened in the 18 hours of labor. That is what Cut, Stapled, and Mended is- three birth stories, completely told by the women who lived them and learned from them. 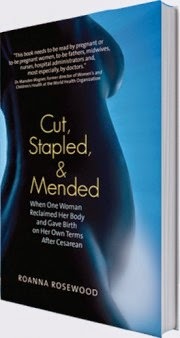 Written by Roanna Rosewood, Cut, Stapled and Mended, is about cesarean section. However, unlike so many cesarean section books out there that dwell on numbers and risk factors and other deeply important but measurable things, this book focuses on the emotional journey of one woman. After all, each cesarean is performed on a single woman and I think we need to humanize those percentages so we can understand the depth of what is actually happening to all these millions of women. Autobiographical in nature, Cut, Stapled and Mended follows Roanna Rosewood on her quest for an elusive natural home birth. While many women are experiencing cesarean section today, Roanna was one of a small but growing group of women who planned for a home birth, but had something very different happen. I believe that birth will always have an impact on a woman, no matter her expectations, her preparations, or her beliefs. But I also feel a special sense of tragedy for women who so strongly desire and so furiously prepare for a natural birth and have surgery instead as their home birth slips through their fingers. Such was the case with Roanna. She experienced not one, but two cesareans (both home birth transfers) in her travels as a maturing woman. She spends thousands seeking every possible natural or alternative practitioner she can find searching for someone who can give her the best chance at achieving the home birth she yearned for. While many of these alternative measures might seem strange to the more mainstream among us, they help us understand the lengths she is willing to go to have a better birth. In the end, she finds peace, healing, and something much more- an appreciation for the uniquely feminine power within her. This is what I loved about the book. I think one of the most damaging things about modern obstetrics and even just American culture is that women often unknowingly don't value the things that make them feminine or their relationships with other women. Her realization is one that we all should have no matter our birth experiences. Too many women hate their feminine side and thus themselves. I found this book both heart wrenching, eye-opening and in the end -- joyful. Roanna details her emotional, physical, spiritual and mental journey towards healing through her pregnancies and births. This ability, to open her heart and her pain for other birth workers, like myself, who have never experienced surgical birth, is a gift. While we crunch numbers and debate techniques and policies, often what is lost is the very real but often glossed over, emotional struggles that women experience as they prepare for birth after a birth that was traumatic for them. Roanna asked me if the book left me feeling depressed. You know what- it didn't at all. I feel like the word "empowering" is over used, but appropriate in this situation. The book is a story about two births that don't go as planned and the journey to VBAC. For me the book was the opposite of depressing- it gives hope for women even those told they could never safely VBAC. She does something that nobody seems to believe she can do. Birth can be triumphant even when the only person who believes that is the mother herself. I thoroughly enjoyed and would recommend Cut, Stapled and Mended both for women seeking VBAC ( especially after a home birth transfer), birth workers, and any seeking to better understand the emotional journey towards VBAC. You can find Roanna’s website here. Her book is available there and on Amazon. 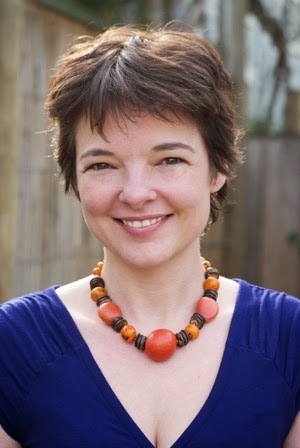 She is the managing director of Human Rights in Childbirth (www.humanrightsinchildbirth.com) and can be found traveling and speaking. she spoke at a conference i went to last year. she was absolutely amazing-i was riveted.